Academia | Home: Free Sociology! My award-winning book wins an award! 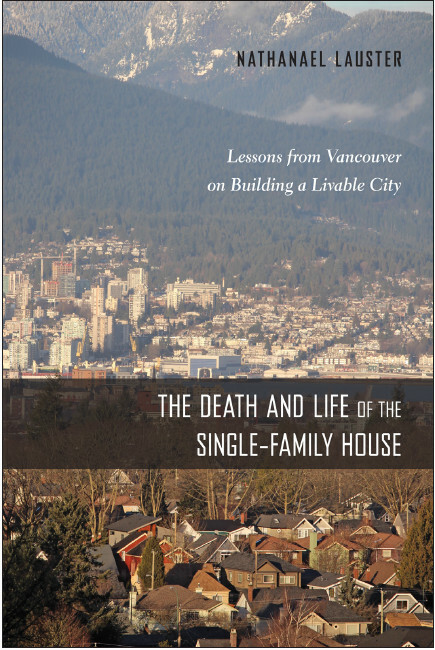 The Death and Life of the Single-Family House just won the Canadian Sociological Association‘s John Porter Tradition of Excellent Book Award. I’m truly honoured by this award, especially by the company it allows me and my book to keep! My thanks go out to the review committee, and also to my very supportive team at Temple University Press., especially the editors of the Urban Life, Landscape, and Policy series. I’m joined by three other members of the UBC Sociology Department on the list of awards handed out by CSA this year, including my good friend Sean Lauer who won the Angus Reid Applied Sociology award as a Practitioner. Incidentally, he and fellow faculty member Carrie Yodanis also have a book out this year, called Getting Married: The Public Nature of Our Private Relationships. Two of our graduate students, François Lachapelle and Patrick Burnett also won an award for their paper, “Canadianization Movement, American Imperialism, and Scholastic Stratification: Professorial Evidence from 1977 to 2017.” To be sure, this is important stuff (and I say that as an American immigrant to Canada and beneficiary of the processes described). But back to the company my book gets to keep! Through the CSA Awards, I’m excited to discover Dalhousie Prof. Karen Foster‘s new book, Productivity and Prosperity: A Sociological History of Productivist Thought, published by the great team at Univ. of Toronto Press. (I’m also looking forward to reading their recently published Gentrifier, but that’s another story). Prof. Foster’s work looks right up my alley in terms of trying to get at how economic concepts like “productivity” get measured and talked about in ways that are both socially constructed (often in a problematic fashion) and also highly consequential in terms of how they shape public policy. Really cool stuff – I’m looking forward to reading it! The list of past award winners of the John Porter Award also places my book in brilliant company. I’ve been longing to get a copy of Vic Satzewich‘s book, Points of Entry: How Canada’s Immigration Officers Decide Who Gets In, from the excellent UBC Press, for quite some time now. This is an area of real interest to me (for instance, I regularly have students read some of the training documents for how immigration officers determine which marriages are “real”). Prof. Satzewich’s influential work has been cited by Canadian policy-makers in recent leadership debates (if wrongly), and it’s another I’m really looking forward to reading. The rest of the list is equally as brilliant (Lesley Wood’s Direct Action, Deliberation, and Diffusion ; Elke Winter’s Us, Them, and Others ; Andrea Doucet’s Do Men Mother? ; Kay Anderson’s Vancouver’s Chinatown – which I cite in my own book! – and many more besides! See the list to fill out your own bedside table). Now I’ll go back to pettier concerns, like listening to myself repeat the phrase “my award-winning book” over and over again, and envisioning how it will look the next time I revise my CV and find myself with something lovely to plant in the vast, otherwise empty landscape of its “Awards” section. So here comes the Cascadia Urban Analytics Cooperative! A new cross-border initiative bringing together UBC with the University of Washington! I’ll be generally curious to see where this goes. The notion of Urban analytics, of course, would suggest some interest in urban issues. But so far, at least, there’s very little mention of anything involving urban studies, urban geography, urban sociology, planning, law, or social science of any sort. It’s early days, of course, but I’d be a bit more encouraged if I saw some mention that “urban” implied people living in cities, and we have some relevant expertise that might be worth tapping into! The Cascadia Data Science for Social Good (DSSG) Summer Program, which builds on the success of the DSSG program at the UW eScience Institute. The cooperative will coordinate a joint summer program for students across UW and UBC campuses where they work with faculty to create and incubate data-intensive research projects that have concrete benefits for urban communities. One past DSSG project analyzed data from Seattle’s regional transportation system – ORCA – to improve its effectiveness, particularly for low-income transit riders. Another project sought to improve food safety by text mining product reviews to identify unsafe products. Cascadia Data Science for Social Good Scholar Symposium, which will foster innovation and collaboration by bringing together scholars from UBC and the UW involved in projects utilizing technology to advance the social good. The first symposium will be hosted at UW in 2017. Sustained Research Partnerships designed to establish the Pacific Northwest as a centre of expertise and activity in urban analytics. The cooperative will support sustained research partnerships between UW and UBC researchers, providing technical expertise, stakeholder engagement and seed funding. Responsible Data Management Systems and Services to ensure data integrity, security and usability. The cooperative will develop new software, systems and services to facilitate data management and analysis, as well as ensure projects adhere to best practices in fairness, accountability and transparency. Down at the University of Washington, the new cooperative will be based at Urbanalytics, a University of Washington initiative drawing on “civic hackers” to think up creative solutions to making urban life better.They have a variety of affiliated projects, including one on “housing stability,” apparently led by a physicist and a neuroscientist. I’ve no doubt these are creative and clever people with lots of insight to offer. But as someone who works in housing – an extraordinarily complicated and policy-heavy field requiring a lot of local knowledge – I worry. Wouldn’t you want to add to your team, say, someone who actually knows something about, I don’t know… housing? On the whole, it’s neat to see the efforts here, and there’s great potential (calling Jens Von Bergmann!) There’s also increasingly a lot of data to play around with, and data scientists have an important role to play. I just worry that brand new efforts to be socially responsible and make cities better won’t get very far without drawing upon the existing strengths of people who have been working toward those efforts for a long, long time. Nathanael Lauster & Jing Zhao. Labor Migration and the Missing Work of Home-making: Three Forms of Settling for Chinese-Canadian Migrants. Forthcoming in Social Problems. Much of migration theory has come to revolve around the category of the “labor migrant,” without taking into account labor, like home-making, that remains unrecognized by the market. Drawing from qualitative interviews with thirty one Chinese migrants in different stages of making a move from Beijing to Vancouver, we attempt to bring better visibility to how the labor involved in home-making intersects with migration. Defining home-making as work in the pragmatic-existentialist context of the stabilization of everyday routines, we uncover three themes to home-making work: settling in, settling down, and settling for. Discussion of these themes reveals two important issues for migration theory: settlement relies upon the work of home-making and the work of home-making in many cases motivates migration. For these reasons, the work of home-making should be more carefully studied within the migration literature. Just putting this up for anyone interested in the two talks I’ll be giving at the two professional Sociology conferences being held simultaneously in Seattle this week! How do people construct the social role of parenthood? What gets enrolled as part of the performance? What are the implications of unsettling expectations? In this paper I pay special attention to how housing relates to the performance of parenthood, drawing upon qualitative analysis of in-depth interviews with 50 residents of Vancouver, Canada. Frequently depicted as the most unaffordable metropolis in North America, Vancouver offers a culturally “unsettled” environment where single family homes, in particular, have moved rapidly out of reach for the vast majority of residents. In general terms, analysis of interviews illuminates how housing provides a material scaffolding for the role of parenthood; offering up both a stage for the performance of parenthood and a crucial retreat from the stage. More specifically, I call special attention to how people treat ownership of a single family home variously as: 1) a pre-packaged co-requisite, 2) a prerequisite, 3) inconsequential, or 4) a foil to performing the role of parenthood. In addition to shaping the role of parenthood, the balance between these four treatments of single family home ownership has important implications for how housing policies and markets influence both childbearing and mobility. Hoarding behavior, at first glance, bridges academic worlds concerned with health and environment insofar as “hoarders” seem to exemplify just how rampant consumerism can lead us all awry. Yet at least a few commentators have suggested the opposite: by virtue of saving rather than discarding, those labeled hoarders often view themselves as rejecting consumerist logics and instead fostering sustainability. The psychiatrists and psychologists who actually study hoarding focus less on the broader social and cultural implications of the phenomenon than on its impact as a mental disorder affecting the well-being of the individuals involved. We argue here that this is both laudable – hoarding has real impacts on well-being that are too often overlooked – and a fundamental mistake. The debate over how people should and do relate to their environments is of central importance to the conceptualization and etiology of hoarding as a disorder. We demonstrate how one position within this debate, that people’s relationships to their environment are best modeled along the utilitarian lines of consumers (see also, homo economicus) has been implicitly adopted within the psychological and psychiatric diagnosis of hoarding. We contrast this position with an alternative; what might be learned by basing conceptualizations of hoarding in the model of people as builders and dwellers? This model takes seriously home-making as a collection of human orientations toward the environment. Its adoption could offer up new implications for the etiology and conceptualization of hoarding as a disorder.